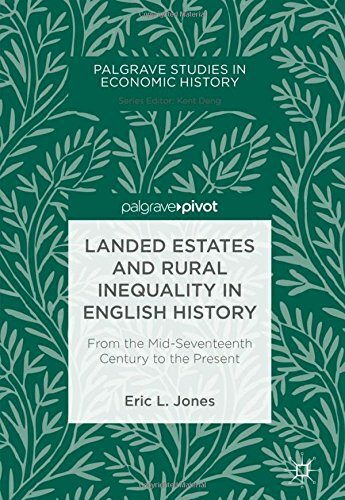 Professor Eric L Jones (1958, Economics) has published his latest book, Landed Estates and Rural Inequality in English History: From the Mid-Seventeenth Century to the Present with publishers Palgrave Pivot. Based on a detailed investigation of local sources, the book examines the history of the landed estate system in England since the mid-17th century. Over recent centuries England was increasingly occupied by landed estates run by locally dominant and nationally influential owners. Historically, newcomers adopted the behaviour of existing landowners, all of whom presided over a relatively impoverished mass of rural inhabitants. Preferences for privacy and fine views led landowners to demolish or remove some whole villages. Alongside extensive landscape remodelling, rights-of-way were often privatised, imposing a cost on the economy. Social and environmental implications of the landed system as a whole are discussed and particular attention is paid to the 19th-century investment of industrial profits in estates. Why was the system so attractive and how was it perpetuated? Matters of poverty and inequality have always been of perennial interest to scholars of many persuasions and to the educated public; with this important book surveying environmental concerns in addition. Eric L Jones is Emeritus Professor at La Trobe University, Australia. He has spent a lifetime working and publishing extensively on the economic history of agriculture and environmental history. To read more about Landed Estates and Rural Inequality in English History and purchase a copy click here.